The Council’s comprehensive new Place Shaping and Delivery Plan has now been approved by Westminster Council’s Cabinet, in much the same form as originally presented in the recent consultation. The new Strategy emerged from the wreckage of the Mayors previous pedestrianisation scheme for Oxford Street and its new district wide approach was broadly welcomed by our organisations. The fact that many suggestions previously made by our various individual amenity societies and other groups had clearly been listened to and incorporated in the new plan meant that we were, and still are, happy to endorse much of what has being proposed. However, as the details of the proposals emerged it became clear that certain concerning aspects, reminiscent of the previous scheme, had also re-emerged. Some very significant proposals – those that advocate the closing or the severe restricting of Oxford Street traffic – were contained amongst the large amount of detail about much else. The extent and severity of these will not yet have been readily appreciated by many of those who would be affected by them. These proposals appear to undermine the principle and purpose of keeping Oxford Street open to traffic and would result in outcomes that we previously understood had been unambiguously abandoned by Westminster Council. 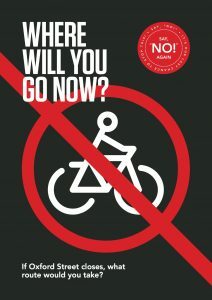 Further they appear to contradict statements made by Westminster both during the recent elections and since the abandoning of the joint Transport for London consultation when we were told that pedestrianisation had been taken off the table for good. 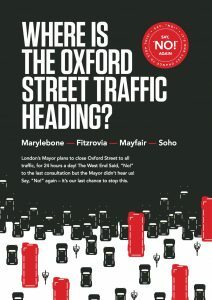 They even appear to contradict statements made elsewhere in the Council’s own Strategy, such as the promise to keep Oxford Street open: “to maintain Oxford Street’s role as an important trafﬁc corridor in the West End”…and “Oxford Street will continue to provide a route for 2 way trafﬁc and not be pedestrianised”. A. The proposal to investigate options to close the section of road around Oxford Circus between John Prince’s Street and Great Portland Street to all east-west traffic and pedestrianise it. B. The proposal to restrict the width of Oxford Street to 2 carriageways only, along its entire length. C. The proposal to close certain sections of Oxford Street to all traffic other than buses at certain times of the day. These proposals are wrong for all the same reasons that the Mayor’s previous pedestrianisation scheme was wrong and we are disappointed, and not a little surprised, to see their re-emergence now after the latter had been so comprehensively rejected in the previous consultation and at the ballot box. In addition they will please few: the Mayor is “underwhelmed” by them, businesses unimpressed; as for the residents, most are at present totally unaware of their existence. Indeed our member societies only gradually became aware of the true extent of the scheme as the consultation progressed. Why have they re-emerged? Possibly because the figure for all the works proposed by the Council is estimated to be £350 million. The allocated Council budget for them is £150 million over the next three years. It therefore will need to be substantially supplemented in some way. The Mayor has already made clear that his proposed £80 million funding is being allocated elsewhere – so WCC need to look to business, particularly the large local stakeholders to help fill the gap. The problem with this is that the interests of these stakeholders is focused on their immediate area of interest rather than the neighbourhood as a whole. The most worrying of all the three proposals is the scheme to pedestrianise Oxford Circus. This not only violates the promises made by WCC to abandon pedestrianisation for good, both during and after the election, but resurrects some of the worst aspects of the Mayor’s discredited scheme. In routing all traffic around neighbouring roads it reintroduces pedestrianisation by recreating a miniature version of the previous plan – that is by creating a needless diversion around a straight line. Only in 2009, £5 million was spent in upgrading Oxford Circus to the new diagonal crossing and since then it has become one of the road’s most famous features. At the time Westminster Council welcomed this as a major triumph in accommodating safely the many numbers of pedestrians in the area. The figures have not changed appreciably since then. However this proposal appears to have come not from Westminster Council but from the Crown Estates. They are the owners of Regent Street and see this as an opportunity to create a gateway project for the area and are prepared to underwrite the costs of undertaking the scheme. Westminster find this attractive as they need to take the pressure off their allocated budget for the reasons stated above. The principle reason cited for the proposal is that of pedestrian safety: that the opening of the new Elizabeth line and the resulting extra footfall will lead to dangerous overcrowding on the pavements and crossings around Oxford Circus. This argument has a superficial attraction which evaporates on further analysis, for this is the very area that, as a result of the opening of the Elizabeth Line, is forecast to have some of the pedestrian pressure removed and to see a relative decline in numbers. The new Bond Street/Hanover Square stations will take on many of the journeys that previously terminated at Oxford Circus. And this will continue into the future – on WCC’s own figures, by 2023 numbers at Bond Street will be up by 22%, at Tottenham Court Road by 25%, whereas the increase forecast for Oxford Circus is 6%. Does this really merit permanently closing Oxford Circus to all east-west traffic? Where is the sense in closing the one part of Oxford Street that has been most recently upgraded at considerable expense, with the one station in Oxford Street that is forecast to have a relative drop in footfall in the future? To accommodate this the scheme proposes to substitute no less than 4 major turns for all traffic travelling along the length of Oxford Street where at present there are none. Each one of these new turns runs across very busy streets which will bring traffic into conflict with pedestrians. Rather than improve safety the potential for accidents will merely be displaced to the smaller roads behind Oxford Circus and indeed, due to all the additional turns made necessary, it could well be dramatically increased. Although it is recognised that there is room for further improvement we would have hoped that this could be realised within the context of the work previously undertaken. For instance, buses and other vehicle turns at Oxford Circus could be banned whilst retaining an east west flow. Also, the proposals for Oxford Circus appear to be in conflict with the Strategy’s own aspirations for John Prince’s Street which will hardly benefit from having all the Oxford Street traffic routed through it. Yet a further problem with the closure of Oxford Circus will likely arise in accommodating the additional traffic crossing Upper Regent Street as this will require longer red light phases against north-south traffic. However, this traffic already faces considerable congestion from the single lane at Oxford Circus often backing up beyond Langham Place and into Portland Place. The proposed diversions will therefore be dangerous, will cause more pollution and will no doubt result in drivers using alternative routes through the surrounding areas, causing yet further traffic displacement into our neighbourhoods. It is significant that whereas the Westminster consultation experienced a high positive response overall, it actually failed to get approval for this scheme. The consultation analysis (taken from the Steer Report dated February 2019) shows that the proposals for Zone F. – Oxford Circus – 45% strongly opposed or tended to oppose the proposals, with only 39% of Westminster residents strongly supporting or tending to support them. Also, the most frequent comments from stakeholders regarding the draft Place Strategy was fear of traffic displacement – approximately 40% cited this, by far the highest of all the concerns listed. The other proposals of concern involving traffic restrictions, or removal, on Oxford Street did not get a specific question in the consultation but they did emerge in part under the proposals for Zone C (the part of Oxford Street containing Selfridges department store, where Oxford Street connects Baker Street and the Mayfair streets of Duke Street, Orchard Street and North Audley Street). Here also, respondents generally opposed the proposals outlined in the draft Place Strategy. In summary, all three of the proposals listed above will result in non-bus traffic being deterred from using Oxford Street even in the parts that remain open. 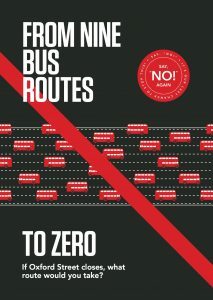 The extra time the buses will take, caused by single lanes and road closures, will inconvenience and even deter bus users. Sporadic and intermittent closure of various parts of Oxford Street and the permanent closure of the parts of the street either side of Oxford Circus will push non-bus traffic into the heartlands of Mayfair, Marylebone and Fitzrovia. So far, we only have the outline proposals for all these schemes, the methodology to justify them is at present being developed, for instance through traffic modelling – which as previous experience has shown, cannot be trusted. The Council has stated that issues arising from the proposals will be listened to and taken into account before deciding which ideas to take forward. But the issues arising from these proposals have been stated and they have been rejected by the majority of respondents to the consultation – but still they have been recommended to be taken forward. Accordingly, whilst we look forward to and support the successful introduction of the large majority of Westminster’s proposals, we will continue to press our objections to this one part of the overall scheme that we feel is mistaken, both through our individual amenity societies and other groups. You can read our Oxford Street Consultation response here.